Pyramids are huge stone structures with square or rectangular bases and triangular sides. They were built as tombs for royalty and often contained precious treasures. Once known as the Golden Land, this mysterious region was transformed into a world of darkness by Ganondorf Dragmite (a.k.a. Ganon) when he captured the Triforce and turned its power to evil. In the Imprisoning War, Ganon's attempt to conquer the Light World was foiled. Ganon was sealed inside the Dark World, but his shadow was never completely lifted from Hyrule. The time has come for one hero to enter the dark domain and confront the menace once and for all. Pyramid of Power: This structure was built to honor the King of the Golden Land. Legends say that Ganon stole the Triforce from a chamber near the top. Dark Palace: The design of this building suggests that it housed the Golden Land royalty. It became home to the Helmasaur King. Swamp Palace: The unusual indoor canals in this building were constructed to wash away unfriendly visitors. Skull Woods: The huge Skulls in this dark forest serve as entrances to an underground labyrinth. Village of Outcasts: Ganon's power turned this once thriving village into a rundown town full of animal-like thieves. Ice Lake: Ganon's power changed the warm area around the Golden Land into a lake of ice and snow. Misery Mire: Hylian lore says that only those who could control the wind and the rain could enter the dungeon underneath this marsh. 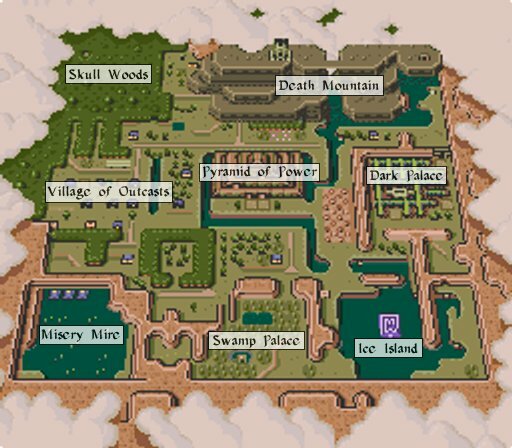 Death Mountain: It is said that Ganon first made his way to the Golden Land through a passage on this mysterious peak. This page was last edited on 7 August 2012, at 03:49. This page has been accessed 68,213 times.